Metal is fast becoming the roofing material of choice among homeowners who are tired of throwing their money away on pricey roof repairs year after year. Asphalt shingles are essentially disposable – they need to be replaced periodically to maintain an optimal level of protection for your home. Wood, ceramic, and even stone roofing materials don’t hold up well against the elements. 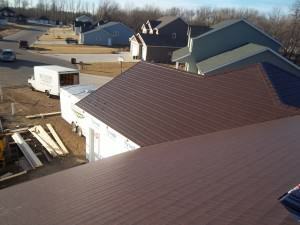 By contrast, metal roofing from ABC Seamless will last a lifetime. Fabricated from heavy-gauge, hot-dipped, G-90 galvanized steel, this roofing truly is a permanent solution, not like other roofing materials needing to be replaced every 10 to 20 years. Who needs that headache? With ABC Seamless, once your metal roof is installed, you’ll never have to think about it again. Storm-force winds – ABC’s roofing materials are screw-secured in place so it stays put when severe weather strikes. Falling debris – Our steel roofs have a Class 4 impact rating – the best rating in the industry! Fire damage – Bonfire embers, fireworks, and other common causes of residential fires are no match for this roofing – it simply doesn’t burn! The days of ugly, boring, gray metal roofs are over – ABC Roofing materials are available in a wide array of colors and styles, enabling you to choose the right profile for your home. To learn more about your metal roofing options, or to receive a no-obligation quote from your local authorized ABC Seamless team, contact us today.